I cannot believe it's almost October! This weekend I'll be traveling (on business) to one of my favorite places in the world, Orlando. Hopefully I'll be able to sneak away from work and hit up Disney World. Did anyone get a chance to catch my post from yesterday? When I woke up this morning my mom said, "doesn't look like your Emma post is doing well, you have no comments". I found that to be a really interesting statement because I don't judge each post on how many comments it gets. If I'm putting up content that I believe in, I think that's a successful post. And if there's something, or someone, I definitely believe in, it's Ms. Emma Watson. Plus, I'd rather get a comment that's meaningful than one that's not. There are regulars who comment on my blog with honest commentary that I look forward to reading each day. What are all your thoughts on the comment phenomenon? BTW with fall comes football. With football comes a crazy BF and an even crazier me. Help. That dress is stunning, love the collar. love this dress with the boots and socks! such a cute indian summer look. and you have a seriously amazing bag collection! i think you nailed it when you said that you look forward to the comments from your regulars. that's exactly how i feel and it's such a nice way to communicate with people from around the world you might not otherwise get to have a dialogue with. that said my football crazed boyfriend and i will be back in new york in november if you ever feel like escaping and taking the dialogue offline! Awww such a cute dress! Love the fun lil pattern on it! I love those sunglasses - I definitely need to buy me a pair of those! thanks for stopping by my blog. 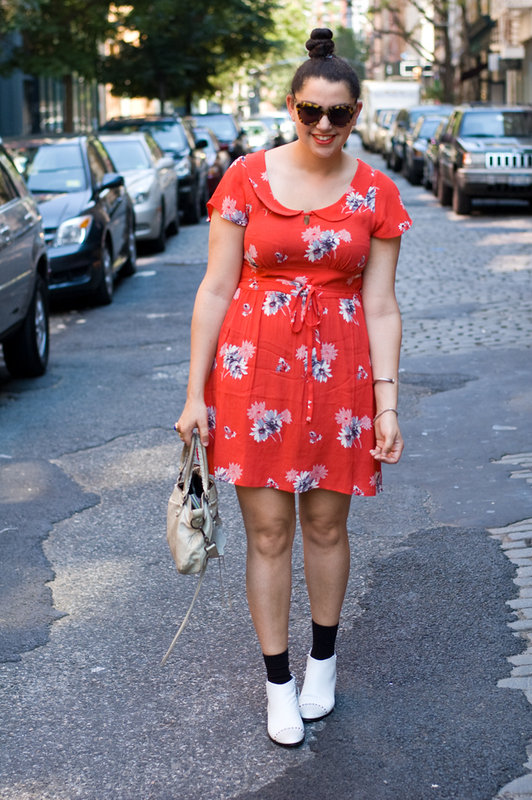 love your blog and your style that dress and sunglasses are too cute! i do look forward to comments on my posts and hope that people will read and enjoy it, but agree that i would rather have comments that mean something rather bloggers just putting their URL down, ill stop babbling now! This is such an adorable dress. Love the color and the print. Summer is over, but it's still quite warm in California. I'm still wearing summer clothing!